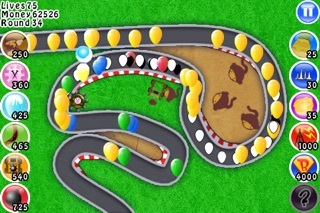 Play the classic Bloons TD mobile version that started one of the most popular strategy game franchises ever! 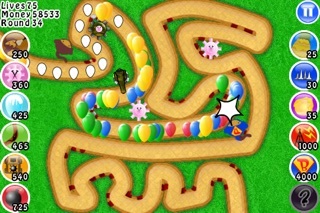 Achieve total Bloon popping satisfaction in this signature monkey-infused tower defense game. 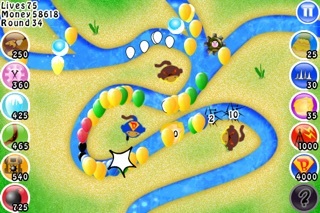 With an army of dart monkeys and a multitude of towers and weapons at your disposal can you pop all the bloons before they escape? 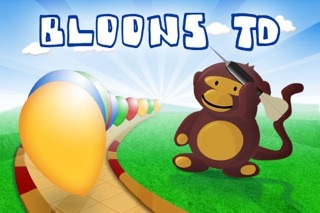 Bloons® TD for iPhone / iPod touch features all of your favorite towers and upgrades, including the almighty Super Monkey. Can you battle your way through 50 challenging levels over 15 exciting tracks and unlock all the gold medals to become the TD master? Features: * All of the Bloons® TD favorites including dart monkeys, tack towers, blade shooters, bomb cannons and super monkeys. * 5 differently themed map packs with 6 classic online levels and 9 brand new exclusive iPhone tracks! * 3 difficulty levels on each track with bronze, silver and gold medals to unlock. 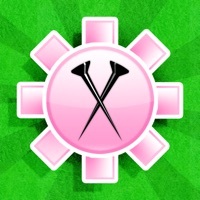 * Continue with the madness in freeplay mode once you have mastered a track. * Intuitive touch interface with two different control systems. *Updated control system making selection of towers easier. Spikes, Pineapples and Glue can now be placed quickly by dragging a set on and tapping anywhere on the path to continue placing. 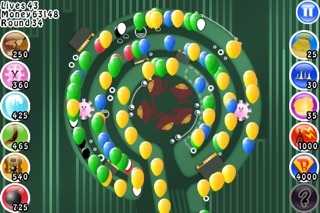 If you want the latest and greatest version of Bloons TD, including co-op multiplayer, check out Bloons TD 5! Please update so it works with new iOS versions. Please update for iOS 12. Thanks! Looks like a good start for the series, even if the graphics are bad. Please make this game compatible with iOS 11! I WOULD LIKE MY 99cents Back!!! I bought this game for 99cents and then you guts failed to update it...now I cannot play! I would like my 99cents refunded to my account or sent to me in the form of a check. This is theft, I paid for a service and it is not being delivered. I paid for the full version of this. It was my favorite game and now I can’t even play what I paid for.